Located in Inspiration Design Center, where parking is easy in the structure, this place is a very classy place. Most of the crowd that come down are professionals dressed in work attire, needing a nice glass of wine for Pau Hana. You can either buy a bottle of wine or get a wine card. 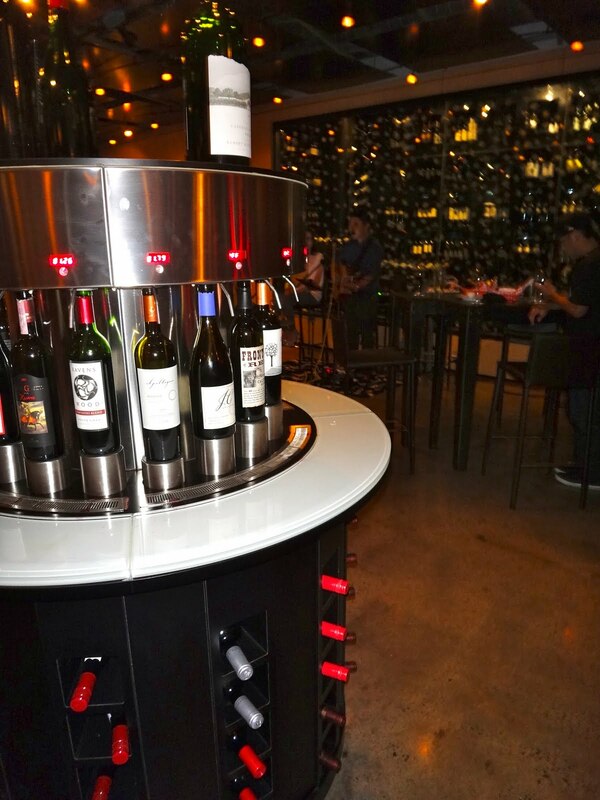 Experience different wines with the press of a button. Stick your card into the wine machine of your choice, press once for 1 oz of your preferred wine, press a second time for 2 oz, and so on. Prices per ounce are above each bottle. On Amuse's special wine nights- Monday and Wednesday- get a wine card, pay $30 for $50 of wine (what a deal! ), and go wine-crazy. There is also a cocktail menu if you're not in the mood for wine. But how can you turn down wine with this awesome value!? Happy Hour happens Monday-Friday 5-7pm, while Wine Taster's Night is Monday and Wednesdays 5-8pm. If you're like me, I go between 5-7pm, so you can get the Wine Taster deal plus the Happy Hour deals on selected food! Their food is great paired with the wine. I highly suggest the grilled cheese (made with TRUFFLE OIL! ), cheese pizza, and kalua pig in a bun. Those are all "winnahs!" Draft Beers, Specialty Cocktails and Special Pupu Menu all $5 during Happy Hour!" There's also live music on Wed-Friday 730pm-930pm. Lime juice, with a Jordan "J" float and sugar rim! Grilled Cheese- you can immediately smell the truffle oil when it is placed on your table. A few grilled cheese left with Pork bun! though I just threw it out. I like my bun with just the tasty, smoky meat! YUM!